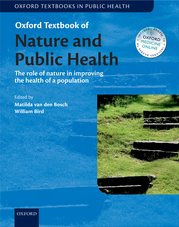 A new book, the Oxford Textbook of Nature and Public Health, edited by Matilda van den Bosch and William Bird is due to publish 4th January 2018. Please see the OUP website for more information. Dr Qing Li, the vice President and Secretary General of INFOM also contributed the following chapter with Dr. Simon Bell.